It's back to the future for the latest Seagate large form factor disk with a low capacity. The company has introduced a 3.5-inch 1TB and 2TB disk drive spinning at 7,200rpm with a slow 6Gbps SATA interface, and called it an Enterprise Capacity drive. Remarkably, other 3.5-inch Enterprise Capacity drives of Seagate's go up to 8TB when air-filled, and 10TB when helium-filled, and have much faster 12Gbps SAS interfaces. What gives? The new drives use ninth-generation PMR recording and are aimed at a market niche that needs an entry-level, small-capacity drive in the 3.5-inch format, not the 2.5-inch one. It's a cheap (we assume; no prices supplied) and cheerful spinner with a 128MB cache, 194MBps transfer rate, two million hours MTBF rating, five-year warranty, and supports 24x7 workloads of 550TB per year. 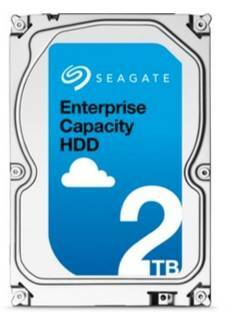 When we read "High-capacity density RAID storage" in this list we thought Seagate might be being ironic but, presumably, it's done its market research and there is sufficient demand for a drive of this type. As far as price goes, Seagate talks about this enterprise-class nearline bulk data storage drive having the lowest possible cost structure for up to five years, which encourages us to think it will be good value. Grab a datasheet here [PDF].